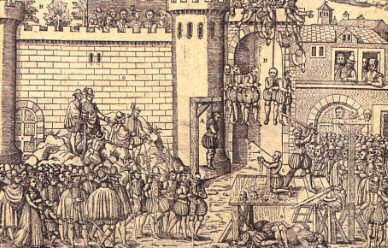 On this date in 1569, the intrepid Huguenot leader Gaspard de Coligny was hanged in Paris and gibbeted at Montfaucon. Luckily for him, Coligny as these events unfolded was miles away from the executioner, at the head of a large armed host. One of the towering figures of France’s bloody Wars of Religion, Coligny (English Wikipedia entry | French) hailed from one of the most illustrious families of the realm; his father was a Marshal of France; as a young man at court in the 1540s he had been fast friends with the Duke of Guise, the staunch Catholic who was eventually the target of the botched Huguenot kidnapping in 1560 that set spark to tinder for sectarian civil war. An admired battlefield commander, Coligny’s conversion to Protestant put a high card in the Huguenot party’s hand, one whom Catholic ultras increasingly yearned to eliminate. Coligny frustrated that aspiration over and over. Just in 1569, he had escaped from a Catholic battlefield victory that saw the capture and murder of Protestant France’s other great leader; then, he routed the Catholics at La Roche-l’Abeille; and, just days before the events in this post, repelled the Siege of Poitiers. With sectarian hatred running high that season in Paris — and the dwindling treasury in need of the capital infusions only forfeiture can supply — the Parlement summoned Coligny to a trial it knew he would not attend, and there condemned him a traitor in absentia. 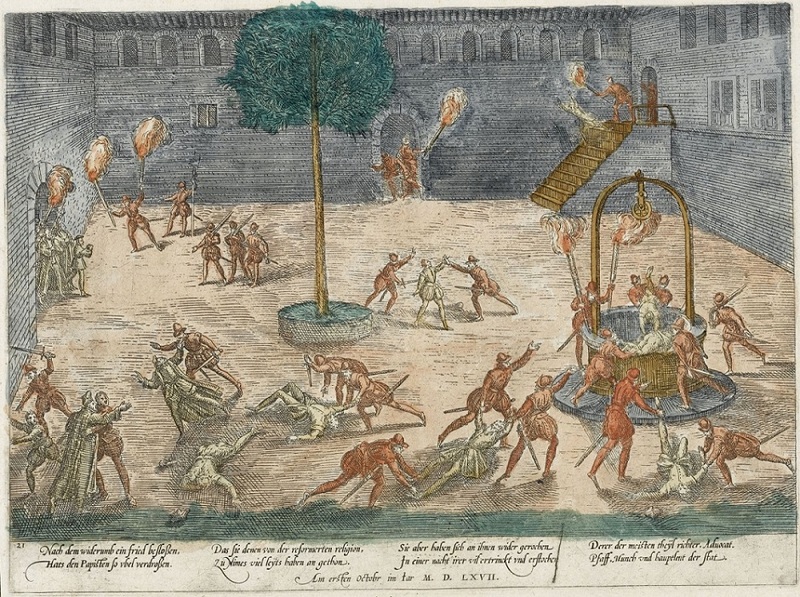 Coligny himself fought on … but the ridiculous sentence foreshadowed his real fate, right down to the horrible gibbet. The gibbet of Montfaucon, from the Grandes Chronique de France by Jean Fouquet (c. 1460). 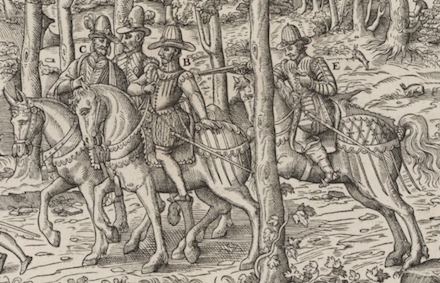 The duke of Guise, who was put in full command of the enterprise, summoned by night several captains of the Catholic Swiss mercenaries from the five little cantons, and some commanders of French companies, and told them that it was the will of the king that, according to God’s will, they should take vengeance on the band of rebels while they had the beasts in the toils. Victory was easy and the booty great and to be obtained without danger. The signal to commence the massacre should be given by the bell of the palace, and the marks by which they should recognize each other in the darkness were a bit of white linen tied around the left arm and a white cross on the hat. Meanwhile Coligny awoke and recognized from the noise that a riot was taking place. Nevertheless he remained assured of the king’s good will, being persuaded thereof either by his credulity or by Teligny, his son-in-law: he believed the populace had been stirred up by the Guises, and that quiet would be restored as soon as it was seen that soldiers of the guard, under the command of Cosseins, had been detailed to protect him and guard his property. But when he perceived that the noise increased and that some one had fired an arquebus in the courtyard of his dwelling, then at length, conjecturing what it might be, but too late, he arose from his bed and having put on his dressing gown he said his prayers, leaning against the wall. Labonne held the key of the house, and when Cosseins commanded him, in the king’s name, to open the door he obeyed at once without fear and apprehending nothing. But scarcely had Cosseins entered when Labonne, who stood in his way, was killed with a dagger thrust. The Swiss who were in the courtyard, when they saw this, fled into the house and closed the door, piling against it tables and all the furniture they could find. 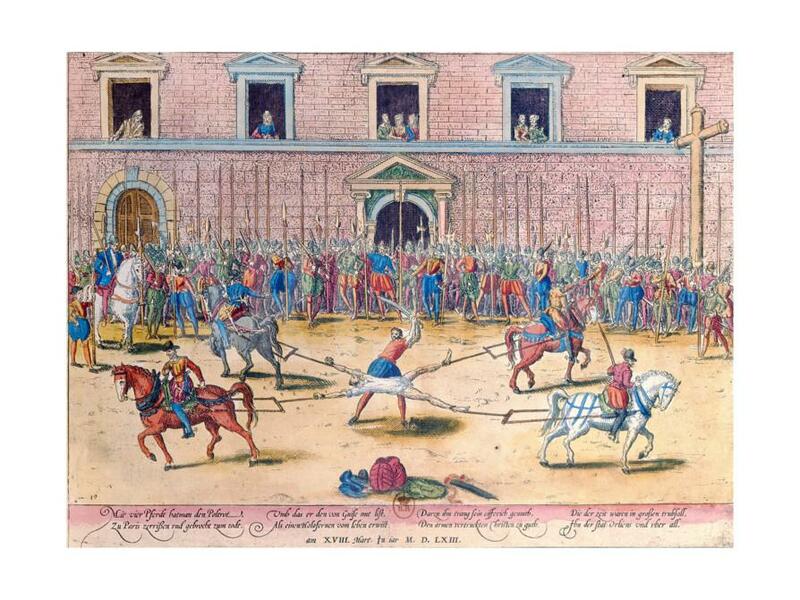 It was in the first scrimmage that a Swiss was killed with a ball from an arquebus fired by one of Cosseins’ people. 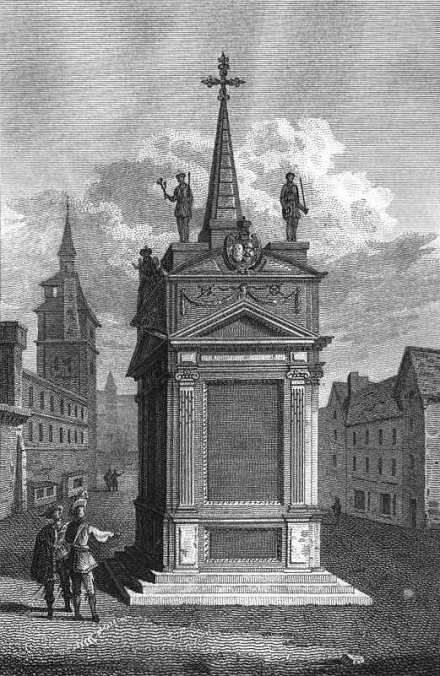 But finally the conspirators broke through the door and mounted the stairway, Cosseins, Attin, Corberan de Cordillac, Seigneur de Sarlabous, first captains of the regiment of the guards, Achilles Petrucci of Siena, all armed with cuirasses, and Besme the German, who had been brought up as a page in the house of Guise; for the duke of Guise was lodged at court, together with the great nobles and others who accompanied him. 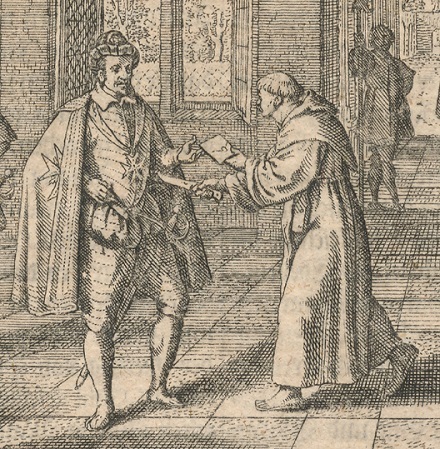 After Coligny had said his prayers with Merlin the minister, he said, without any appearance of alarm, to those who were present (and almost all were surgeons, for few of them were of his retinue): “I see clearly that which they seek, and I am ready steadfastly to suffer that death which I have never feared and which for a long time past I have pictured to myself. I consider myself happy in feeling the approach of death and in being ready to die in God, by whose grace I hope for the life everlasting. I have no further need of human succor. Go then from this place, my friends, as quickly as you may, for fear lest you shall be involved in my misfortune, and that some day your wives shall curse me as the author of your loss. For me it is enough that God is here, to whose goodness I commend my soul, which is so soon to issue from my body.” After these words they ascended to an upper room, whence they sought safety in flight here and there over the roofs. Meanwhile the conspirators, having burst through the door of the chamber, entered, and when Besme, sword in hand, had demanded of Coligny, who stood near the door, “Are you Coligny?” Coligny replied, “Yes, I am he,” with fearless countenance. “But you, young man, respect these white hairs. What is it you would do? You cannot shorten by many days this life of mine.” As he spoke, Besme gave him a sword thrust through the body, and having withdrawn his sword, another thrust in the mouth, by which his face was disfigured. So Coligny fell, killed with many thrusts. Others have written that Coligny in dying pronounced as though in anger these words: “Would that I might at least die at the hands of a soldier and not of a valet.” But Attin, one of the murderers, has reported as I have written, and added that he never saw any one less afraid in so great a peril, nor die more steadfastly. Then the duke of Guise inquired of Besme from the courtyard if the thing were done, and when Besme answered him that it was, the duke replied that the Chevalier d’Angouleme was unable to believe it unless he saw it; and at the same time that he made the inquiry they threw the body through the window into the courtyard, disfigured as it was with blood. When the Chevalier d’Angouleme, who could scarcely believe his eyes, had wiped away with a cloth the blood which overran the face and finally had recognized him, some say that he spurned the body with his foot. However this may be, when he left the house with his followers he said: “Cheer up, my friends! Let us do thoroughly that which we have begun. The king commands it.” He frequently repeated these words, and as soon as they had caused the bell of the palace clock to ring, on every side arose the cry, “To arms!” and the people ran to the house of Coligny. After his body had been treated to all sorts of insults, they threw it into a neighboring stable, and finally cut off his head, which they sent to Rome. They also shamefully mutilated him, and dragged his body through the streets to the bank of the Seine, a thing which he had formerly almost prophesied, although he did not think of anything like this. 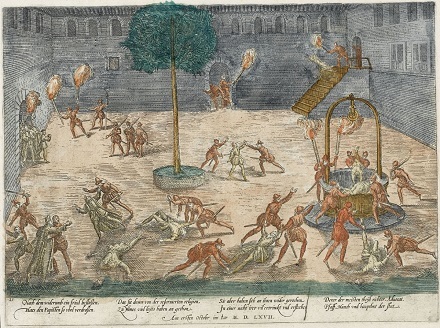 As some children were in the act of throwing the body into the river, it was dragged out and placed upon the gibbet of Montfaucon, where it hung by the feet in chains of iron; and then they built a fire beneath, by which he was burned without being consumed; so that he was, so to speak, tortured with all the elements, since he was killed upon the earth, thrown into the water, placed upon the fire, and finally put to hang in the air. 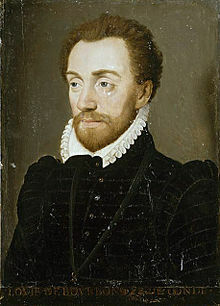 After he had served for several days as a spectacle to gratify the hate of many and arouse the just indignation of many others, who reckoned that this fury of the people would cost the king and France many a sorrowful day, Francois de Montmorency, who was nearly related to the dead man, and still more his friend, and who moreover had escaped the danger in time, had him taken by night from the gibbet by trusty men and carried to Chantilly, where he was buried in the chapel. (Belatedly) part of the Themed Set: Executions in Effigy. 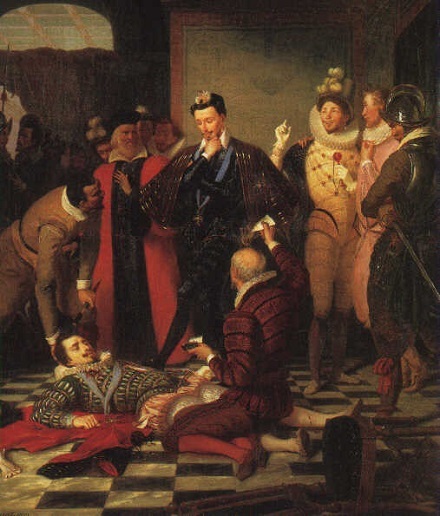 On this date in 1560 the second Baron de Castelnau, Jean Boileau, was beheaded as a Huguenot traitor. His was one of the opening casualties of France’s devastating Wars of Religion. We find Castelnau’s end before war began, when the Huguenot party — although it had been pressed sorely enough for martyr–making in the years of the Reformation — was perhaps not yet quite steeled for the measure of purposeful violence it would require to conquer state power. 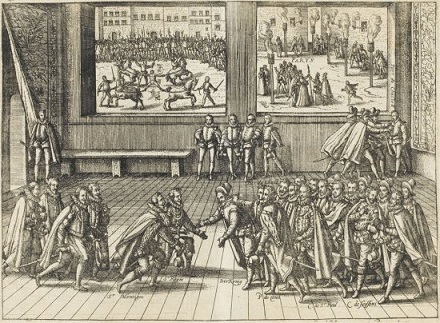 After the events in this post, the great Huguenot leader Gaspard de Coligny would remonstrate at a royal Council of Notables protesting the loyalty of the realm’s Protestant subjects. Two years later, he was commanding rebels in the field; a decade later, he would be murdered in the St. Bartholomew’s Day Massacre. “Rashly designed and feebly executed,”* the plan of these 1560 pre-rebellion Huguenots was to tilt France’s religious policy by muscling out the top Catholic. 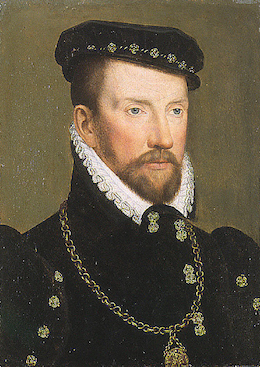 If it were possible to imagine such a gambit it was amidst the flux following King Henri II‘s sudden death at the jousts in 1559. his sickly 15-year-old heir Francis was dominated by the staunchly Catholic Duke of Guise; policy accordingly trended away from religious accommodation for the Calvinist Huguenot minority. 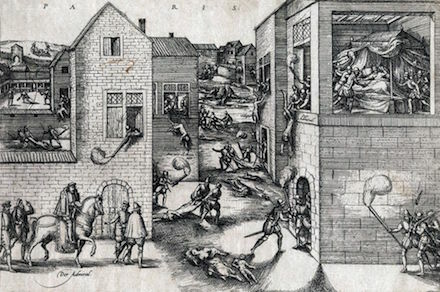 So the muscling-out plan was born: the Amboise conspiracy. Named for the castle where the attempt was unsuccessfully executed, this plot aimed to seize the Duke of Guise by main force and begin forcing a more satisfactory policy direction on the malleable sovereign. This scheme became very widely known among Protestant nobles and even bourgeois, who variously signed on or demurred; no surprise, someone in the ever-widening circle of confidantes eventually leaked it to the court. Guise quietly made ready the castle at Amboise to repel the putsch, and when the attempt was made in mid-March it was not the Catholics but the attacking Huguenots who were surprised and routed. Over 1,000 men involved in the attempt were slaughtered in the ensuing days — by the rope, the sword, or the waters of the Loire. Its chief architect, La Renaudie, was killed in the skirmishes but his corpse was still posthumously mutilated. Castelnau, in consequence, surrendered the castle of Noizai to the Duke of Nemours, who took an oath and signed it, that no harm should happen to him or his followers. They went together to Amboise, where the unfortunate baron found that the promise which had been made him was not binding, for the Duke of Nemours had exceeded his orders. A century-plus after events in this post, when France revoked the Edict of Nantes and resumed official harassment of Huguenots, the Baron Castelnau of that time (our Jean Boileau’s great-grandson) was clapped in a dungeon. His son and heir Charles escaped to England where the family continues to this day — the Boileau Baronets. * Cambridge Modern History, vol. 14. 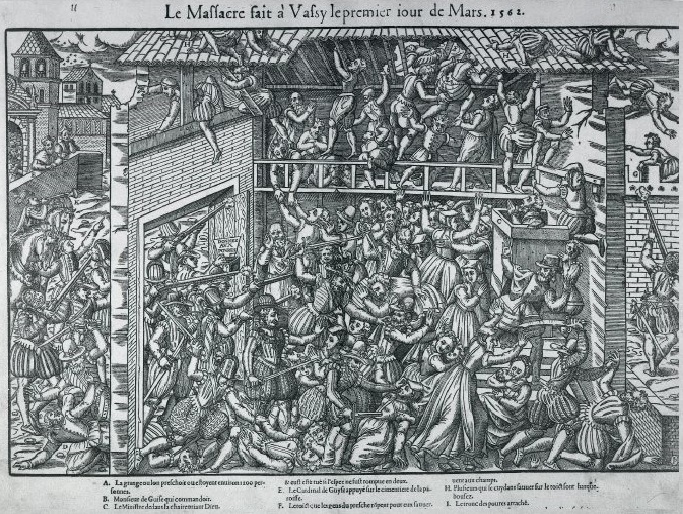 March 1 was the date in 1562 of the Massacre of Vassy. This horror supplies to historical periodization the opening date of the Wars of Religion that would ravage France for the balance of the century. After the shock jousting death of Henri II, sectarian tensions spun out of control under the unsteady succession of sons still in their minority — and the power behind the oft-transferred throne, Catherine de’ Medici. But Catherine was a foreigner and the royal authority rested uncertainly on her children’s wee heads. Tense as matters already stood between Catholics and Huguenots, the realm’s shaky sovereignty disinhibited both confessions when it came to ever more irksome provocations. Seeking to steer past the looming civil war, Catherine promulgated a decree of limited toleration for Huguenots, who were now to be permitted to worship publicly outside of towns. 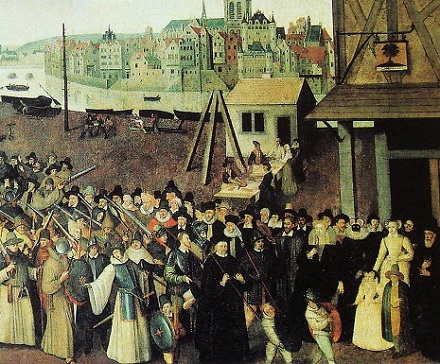 This is called the Edict of Saint-German or the Edict of January — as in, January of 1562, two months before our massacre. It is not taught in politics classes as a triumph of governance. Whether this right even had force of law at the moment of our story is unclear, inasmuch as Catholic parlements whose ratification was required dragged their feet when it came to reading the edict into the statutes. But some incident like this was looming no matter where things stood from a scriptorium proceduralist’s standpoint. At Vassy (or Wassy) on our date arrived the retinue of Francis, Duke of Guise. The Guises were a proverbial more-Catholic-than-the-Pope house, and Francis was not the sort of man to pass with equanimity the spectacle of Vassy’s Huguenots openly holding heretical services in a barn. His retainers tried to barge in. High words were exchanged. Scuffles gave way to brickbats and when something struck the duke’s own person a vengeful slaughter of the Calvinists ensued. Warfare followed fast upon the publication of this atrocity. The chief Protestant lord, the Prince of Conde, openly mobilized for hostilities, seizing and fortifying Protestant towns — and the Catholic faction likewise. Inside of a year, Guise himself would be slain during a siege: one of the first wave of casualties amid 36 years of civil war. 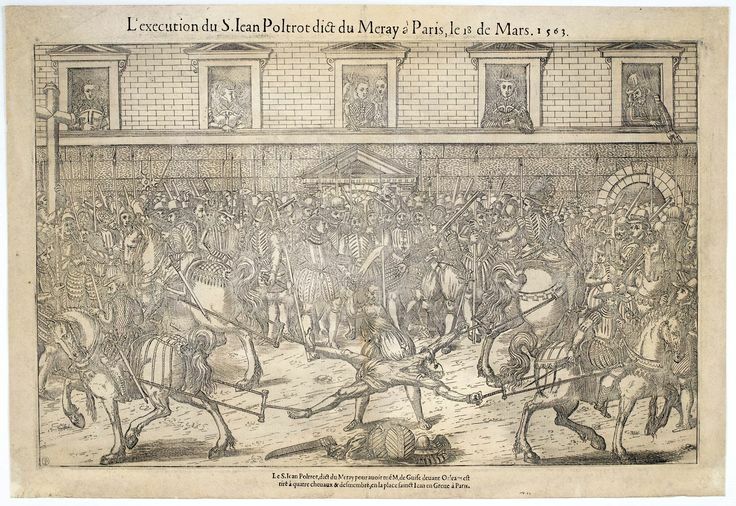 In an admittedly borderline “execution”, Louis de Bourbon, the Hugueunot Prince of Conde, was killed summarily at the end of the Battle of Jarnac on this date in 1569. This nobleman’s conversion to Protestantism had been attended with the zeal so usual to that period. In the case of Conde (English Wikipedia link | French), that meant dipping his beak into some dramatic plotting. 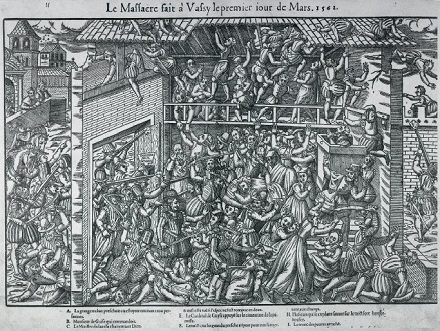 Though nothing could be proved about him, the Catholic faction suspected him of being a leading spirit in the 1560 Amboise Conspiracy, a plot to kidnap King Francis II. Nothing daunted by its failure, he spearheaded the even riskier Surprise de Meaux, a design to seize not only King Charles IX but the rest of the royal family in 1567. This time, failure triggered a whole new installment of the on-again, off-again Wars of Religion. The result was a smashing victory for the Catholics. As the disaster unfolded, Conde, wounded and alone, tried to offer his surrender to an enemy guardsman. He was instead shot on the spot — and his body borne back to Catholic lines for jeering. 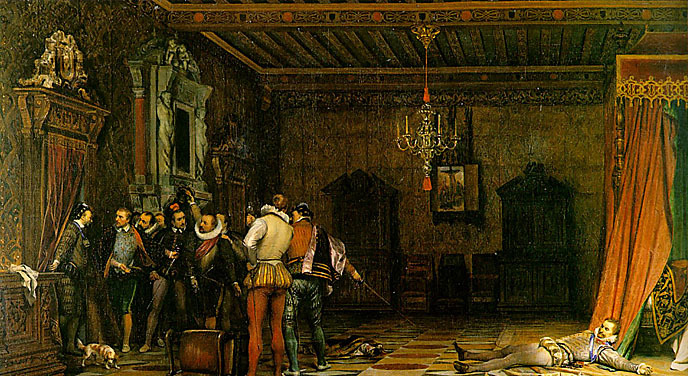 This crippling defeat set the stage for the uneasy truce that quelled religious bloodshed in 1570 — the truce that would be shattered by the 1572 St. Bartholomew’s Day Massacre. * The teenage Walter Raleigh fought at this battle on the Huguenot side.